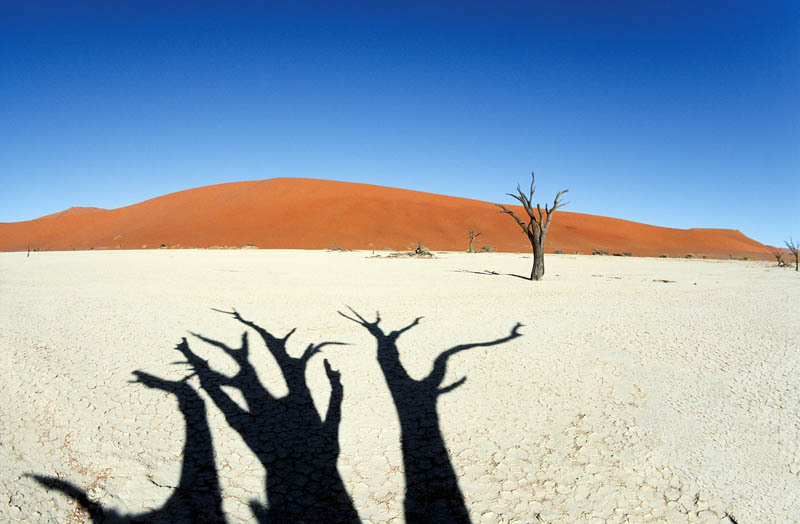 If you have ever been to Dead Vlei close to Sossusvlei in Namibia, you will know that it is a place known for two things – haunting trees reaching out from the pale earth and pale tourists reaching for their cameras. There are so many photographs taken of the vlei that it is almost impossible to be original. The emptiness and desolation of the place is so overwhelming that many avid photographers have captured the scenes, only to return home to find images identical to theirs published everywhere. For there are only a few images that one can take of the place. It is only the obsessive photographer who goes back time after time, who manages to look past this barrier of predictability and capture an original image of the well-photographed scene. Yet sometimes it is not only the obsessive but also the forgetful who get it right. Like Heinrich. While photographing for Art of Nature, Heinrich walked down the long, sandy track to Dead Vlei with a bag full of all the equipment he would need. Or so he thought. He had visualized what images he would take of the vlei, using his 16-35mm lens, and he knew exactly what he wanted. When he arrived, he immediately dropped his camera bag to the ground and took out his camera. If you have ever been to Dead Vlei, you will know that to jog back to your vehicle for a lens is not wise, because by the time you’ve fetched it and returned to the Vlei, the light will have gone and your legs will be jelly. So Heinrich had to shoot with what he had. On closer inspection, he discovered that the only wide lens he had with him was his 15mm fisheye. This was a disaster because the fisheye lens tends to distort landscapes terribly. But he persevered. First he photographed the landscape with the horizon a third from the bottom, but it was severely distorted and looked totally unnatural. After experimenting for a while, he discovered that if he placed the horizon in the centre of the image, it did not distort at all. Also, subjects further away from the lens tended to be distorted far less than subjects close to the lens. He aimed into the sun and this created a pleasing image, as the fisheye lens is so wide that the sun was tiny in the frame and could be an enhancing element of the image. But the image that he saw and wanted to take was with front lighting, shooting towards the dunes to get the vivid orange, blue and white colours. The problem was that the lens was so wide that as soon as he aimed with the sun, he saw his own shadow in the viewfinder. It didn’t matter what he tried, his shadow was always there. So he “made a plan” and stood at the base of one of the dead trees. This worked, because not only did he manage to hide his own shadow in the shadow of the tree, but the tree shadow also produced a pleasing black, crack-like shape spreading from the base of the image and leading up into it. The image worked because it was different. Photography is not about what equipment you take along – it’s about what you do with the equipment you didn’t forget.